Structural engineering, civil engineering, geotechnical investigation and foundation engineering. 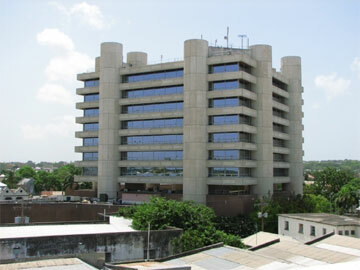 The headquarters for the Central Bank of Barbados was brought under a single location close to the heart of Bridgetown. 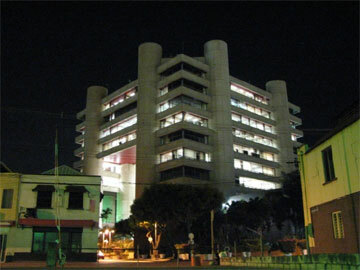 The development consisted of a 10 storey tower block, an adjacent Recital Hall and a car park with two levels, and a two storey Security Building. The superstructure of the 10 storey tower block consisted of 12 No. 5m diameter reinforced concrete towers rising approximately 50m high. The floorplates were formed of a concrete topping on profiled metal decking that sat on primary and secondary structural steel beams that were supported off the reinforced concrete towers. Piled foundations consisting of Franki bulb piles were used to support the superstructure. The signature aspect of the 33m square Recital Hall Building was the structural steel roof. This roof used a 2.5m deep two way span CUBIC space frame which was the first of its kind to be erected in the Western Hemisphere.